Martini Northern constructed a nearly airtight hotel with the functionality to withstand Mount Washington’s winds in a classic New England design to which visitors have become accustomed. The Glen House, a newly constructed 68-room hotel at the base of the Mount Washington Auto Road, may technically be one of the newer structures in the region, but its roots run deep in the White Mountains. The new hotel, built by construction management firm Martini Northern, of Portsmouth, is the fifth iteration of The Glen House to stand near the site of the original, which opened in 1852 to visitors flocking to the Northeast’s highest peak. The new, stately structure, which opened to the public on Sept. 12, pays homage to its predecessors by including aspects of its previous incarnations, offering a classic look in a bucolic setting. The overall design is similar to the previous Glen House featuring clapboard siding and a front porch that evokes a traditional New England look, much like the grand hotels of New Hampshire. While it may have the feel of a hotel that has been in place for generations, Martini Northern used an innovative approach to construct an energy efficient, sustainable, self-sufficient carbon neutral building. Thirty geothermal wells provide heating and cooling while future offsite hydro and solar will provide further energy generation. Additionally, The Glen House has four inches of rigid and spray foam insulation on all exterior walls and eight-inch insulated hunter panels on the roof. The result is a very tight envelope for the building that sits in an area prone to excessive wind and cold. At the heart of the three-story hotel is its expansive great room, which extends from the lobby to a welcoming sitting area featuring a towering stone fireplace. Massive windows reach up to the cathedral ceilings framing expansive views from the west-facing rooms and lobby overlooking a network of trails as well as spectacular views of the Presidential Range. Step further inside and visitors will discover walls adorned with vintage photography that illustrates the long and storied life of the Mount Washington Auto Road, and The Glen Houses that came before — a touch that carries some of the historic DNA from its previous life. The reception desk and bar incorporate boards salvaged from an old barn on the property. 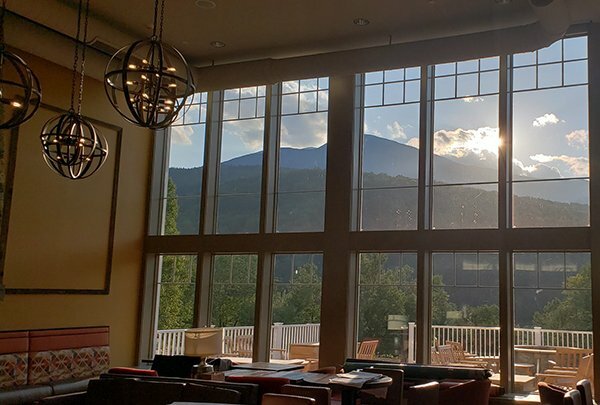 At the heart of the three-story hotel is its expansive great room, which extends from the lobby to a welcoming sitting area, with spectacular views of the Presidential Range. The guest rooms feature comfortable Shaker-style designs — providing a traditional feel — and yet guests can take advantage of amenities such as a gym, several dining options, an indoor salt water pool and complimentary Wi-Fi throughout. Planning and design for the project began in earnest in 2015. Construction began in April of last year and was completed in September. As with any project, there were challenges — not the least of which was the location. Though beautiful, the setting presented a few obstacles that needed to be overcome. First and foremost was the weather which shortened the construction season and impacted workers every day. Building in Pinkham Notch, located well north of most population centers, the project started with a sense of urgency as it progressed through the spring and summer of 2017. Nearly 20 days were lost during the long winter months as conditions made getting workers and material to the site, through the snow and ice, extremely difficult. It was just one of several elements that made the project unlike any other. Owned by the Mount Washington Summit Road Company and managed by Olympia Hotel Management, The Glen House sits near the base of the Auto Road — a landmark that Middleton is coincidentally quite familiar with. It’s also a return to earlier projects for the Portsmouth-based firm. Middleton has now worked on projects at the summit and the base of the 6,288-foot mountain. 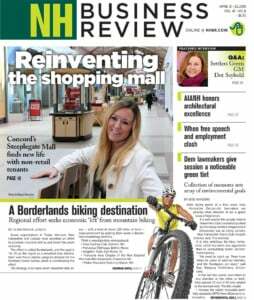 In addition to Martini Northern, the project team included BMA Architectural Group of Amherst and Bedford-based design firms Stibler Associates and TFMoran as well as HEB Engineers of North Conway and Yeaton Associates of Littleton. Martini Northern’s onsite team was led by superintendents Ray Michaud and Roger Davis, and assistant superintendent Ben Middleton. Key subcontractor partners on the project included GB Carrier Corp., of Conway; Chestnut and Cape, Inc., of Northwood; as well as Granite State Plumbing & Heating of Weare, Ray’s Electric, of Berlin, and Superior Fire Protection Inc., of Hooksett. Established in 1999, Martini Northern is a Construction Management/GC firm that oversees building needs throughout New England on institutional, corporate and healthcare markets.